Our entry level position, this career requires no prior experience lawn care or landscaping. Pay starts at $13.20/hour and you're responsible for owning your job site. After you learn the ropes of Dowco, it's your turn to drive a truck and lead a team. Pay starts at $13.20/hour and you're responsible for owning the whole day's work. Our lawn care technicians are the backbone of our fertilization and weed control program. Usually working solo, they are responsible for keeping our client's lawns green and weed free by providing lawn applications and making recommendations along the way. 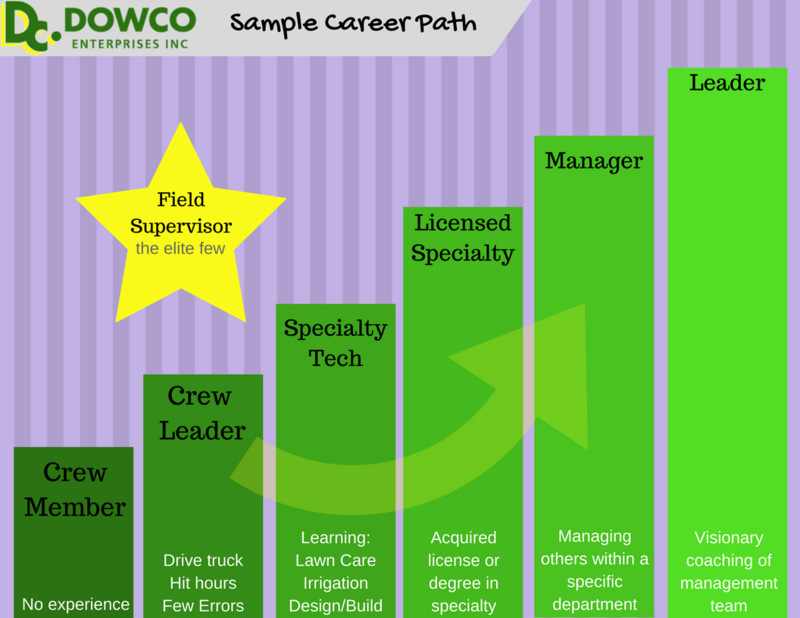 Once you've learned the ropes of Dowco's lawn care division, it's time to play a bigger role by getting your license through the state of Missouri. You're now also responsible for training others and ensuring proper product purchases and mix rates. If you like to see the instant gratification of your work, our landscaping division is for you. You're responsible for installing plant material and hardscapes according to the direction and scope of our horticulturist's designs. Dowco's growing irrigation division is in charge of helping our clients with responsible water management through their automated, underground sprinkler systems. As a technician you provide startups, winterizations, repairs, and inspections. Irrigation systems are complex and we understand the skills and knowledge it takes to expertly install and repair them. With a Journeyman license and/or St. Louis Backflow Certification, you're responsible for managing the irrigation employees, parts inventory, sales process, and repairs. Proudly wearing white shirts, our elite few field supervisors have proven their leadership abilities through Dowco Academy and their tenure with the company. You are responsible for owning the week at Dowco by preparing crew schedule, truck and equipment assignments, and monitoring the quality in the field. The client liason, Dowco's account managers are on the front lines of sales and communication with our number one fans. You are responsible for generating and closing enhancement sales, ensuring 100% retention of VIP customers, and meeting or exceeding required profitability of jobs sold. Our horticulturists excel in designing and installing planting schemes for enhancement projects as well as reviewing existing plantings for current clients during site visits to solve problems and bring client dreams to reality. You are responsible for supervising and assisting in all stages of the process from generating leads, selling and maintaining. An integral player in making sure our client's are getting the services they desire, you are responsible for owning the seasons of Dowco by onboarding, directing and training employees within your department(s). Operations Manager - coming soon! Ready to get started? Fill out an application today and we'll be in touch to schedule an interview!